My hubby and I love exploring together, whether it be mountain trails, desert dunes or superfoods. Lately we have been enjoying our time perusing vegan/superfood cookbooks and planning meals together as we make efforts to alkalize, vegefy and up the raw factor in our diets. 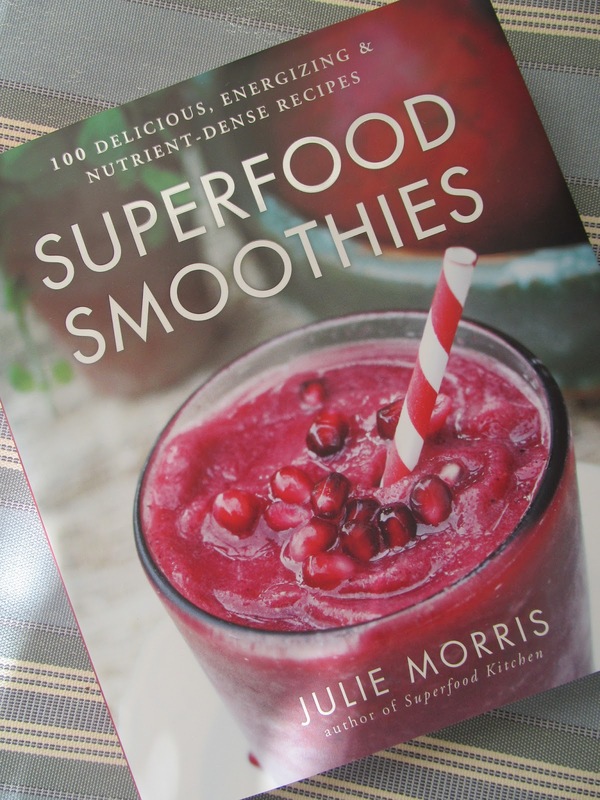 One of my favorite cookbooks is Superfood Kitchen by Julie Morris. My copy is actually her original edition titled Superfood Cuisine. It’s my comfort book. 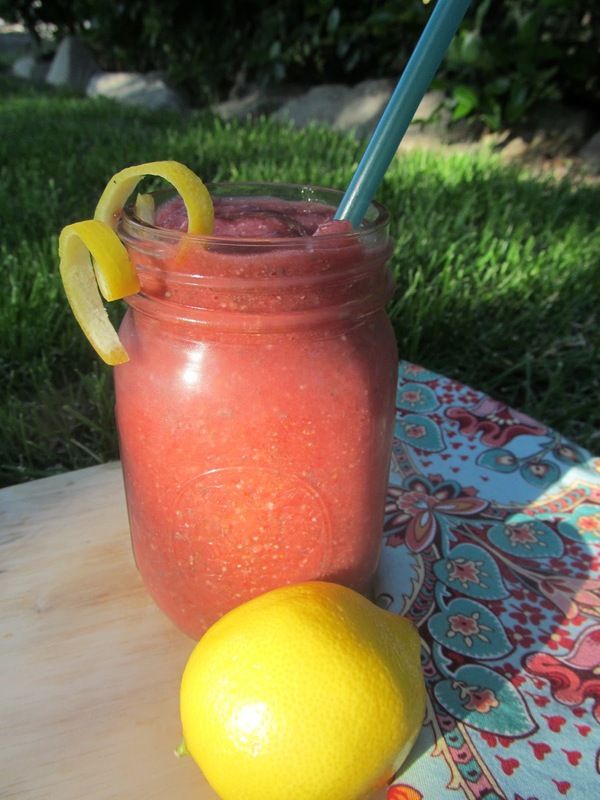 I feel healthier just looking at the beautiful photos of her superfood creations! So, when her Superfood Smoothies book came out, my thoughtful husband ordered a copy for me right away. I was excited to get my new book in the mail and my hubby immediately scanned the new recipes. He loves concocting new smoothies (I’m beginning to think he simply enjoys the challenge of seeing how many superfoods he can pack into one smoothie!). The photos, of course, are so refreshingly appealing and with the weather warming up quickly around here, I am suddenly in the mood for a smoothie! There are so many interesting flavor combinations to explore. How fun to have a new little adventure before us! 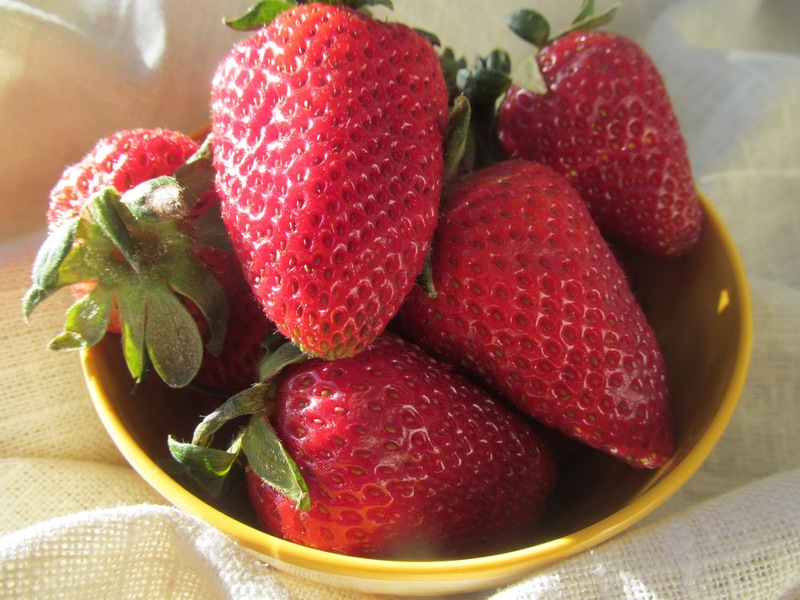 Since I had a batch of freshly dried organic chamomile flowers and a bowl of scrumptious looking strawberries, I thought I’d explore this new flavor combination in a smoothie. I needed my strawberries frozen and my chamomile tea chilled, so I washed and sliced the berries for freezing setting aside a scrumptious few for breakfast. Then I brewed myself some extra chamomile tea, some to chill for a smoothie and a cup to sip with my morning berries. It was such a lovely morning and it won’t be long before it’s too hot to enjoy an early morning cup of tea unless it’s on ice. 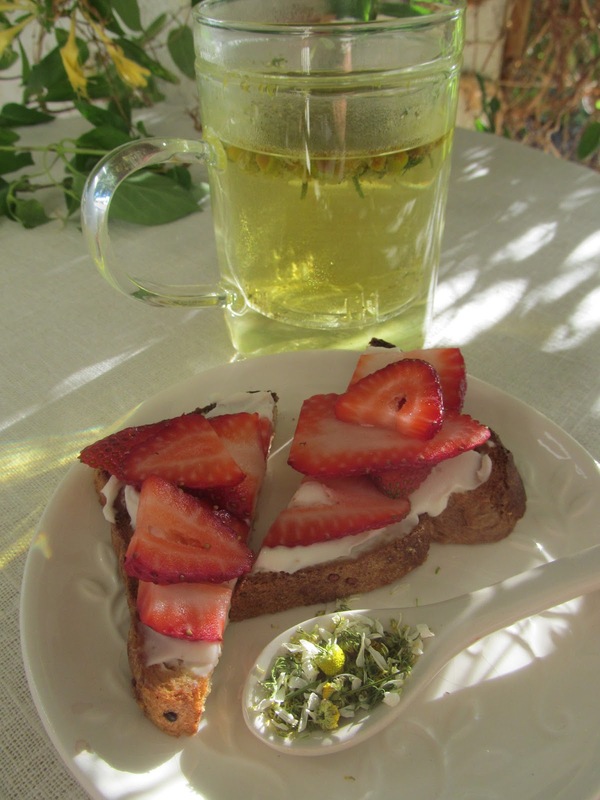 So, I sat on the patio with my crazy chamomile and my scrumptious strawberries on gluten-free toast with vegan cream cheese. I’m glad I took my few moments to enjoy such a breakfast because before I knew it, the day was gone. That’s what happens, more often than not. So, the smoothie would have to wait for tomorrow. Something to look forward to! I followed the recipe from the book exactly. I rarely do that. But I wanted to explore the chamomile-strawberry flavor combo without any intrusions from my typical let’s-just-toss-that-in-too modifications. I was so happy to have some mulberries left from my Superberry Sunday because this recipe calls for 1/2 cup dried white mulberries. In this household, that’s a pretty precious amount of mulberries, so I’d consider this smoothie a bit of an indulgence. There are many more fun and interesting flavor combinations to explore in this wonderful little book of superfood smoothies. I quite enjoyed this refreshing smoothie on a quiet Sunday morning. It was light, fresh and fruity. 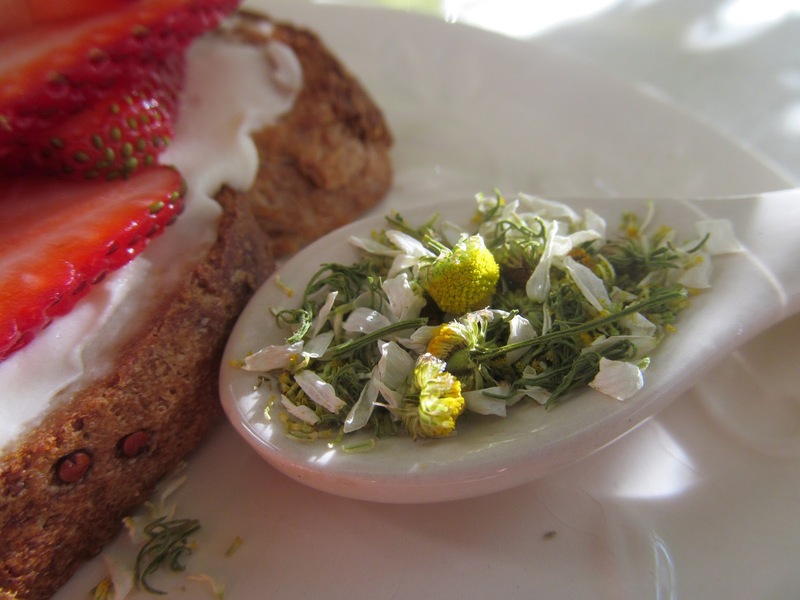 The strawberries and chamomile seemed to be a complementary pair and the mulberries were certainly a treat. This recipe made two me-size smoothies, so I put one in the freezer to grab for the work week. It will be a perfect recipe for those hot summer mornings when I’m running late. 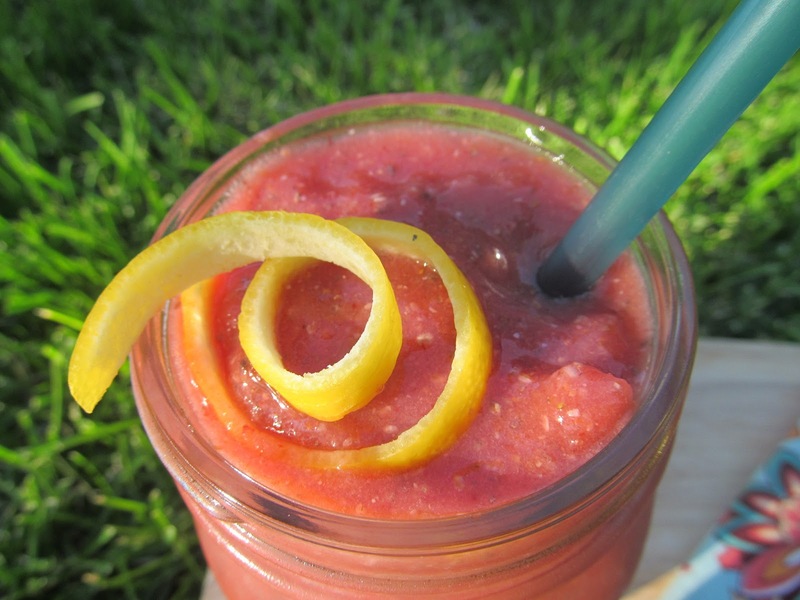 I think I will try to stock my freezer with pre-made summer smoothies and I am looking forward to exploring more fun flavor combinations! It takes some effort sometimes, but I can always find a few moments in my busy days to create an adventure for myself. It doesn’t always have to be climbing a mountain or roaming the desert. Sometimes the best adventures are found in the simplest of things. Seek solace in the simple things. Try something new. Create your own adventure.